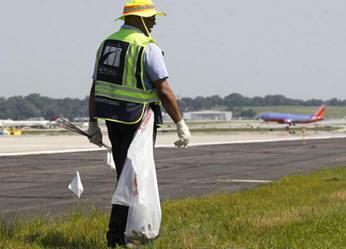 November 16, 2013 - The Federal Aviation Administration (FAA) and the Massachusetts Port Authority (Massport) unveiled the first automated detection system in the U.S. for debris on airport runways that covers an entire runway length. The system to detect Foreign Object Debris (FOD) is fully installed and operational on Boston Logan Airports busiest runway, 9/27. On July 25, 2000, an Air France Flight 4590 departing Charles de Gaulle International Airport ran over a piece of titanium debris from a Continental DC-10, shredding a tire and slamming rubber debris into the plane’s fuel tank. The subsequent leak and fire caused the Concorde to crash, killing 100 passengers, nine crewmembers, and four people on the ground. Using technology to find and remove potentially damaging objects on the airfield takes safety up another notch at Logan Airport, said FAA Associate Administrator for Airports Christa Fornarotto. Massport has a history of investing in cutting-edge technology and working with the FAA on important airport safety initiatives. The FAA funded $900,000 of the $1.7 million detection system installation through the Airport Technology Research Program, under an agreement that enabled Massport to provide the remaining funding and procure the technology. The agreement also calls for a one-year study to evaluate the safety benefits of an automated detection system compared to an airports traditional FOD management best practices. Debris damage to engines and aircraft is estimated at billions of dollars a year, and can lead to serious accidents. Airport operators traditionally use vehicles to scan and clear airport runways, taxiways and aprons using sweepers, vacuums and magnet bars that are operated manually. Automation can provide continuous monitoring and detection, as well as audible alerts and precise information about the location of FOD the system detects. The FAA began conducting performance assessments of automated FOD detection systems in 2007 to establish performance standards and develop advisory documentation for airports. The FAA has alerted the airport community that limited discretionary Airport Improvement Program grant funding will be available for operational FOD detection systems at three large hub airports across the country. The FAA is working with Miami International Airport to install a FOD detection system on one runway at Miami in fiscal year 2014. The FAA will provide an Airport Improvement Program grant for 50 percent of the cost. The airport will seek competitive bids, so the manufacturer of that system has not been determined. The FAA will continue to evaluate new detection systems as they are available. The FAA is working with Chicago O’Hare International Airport, through the Center of Excellence in Airport Technology, to study and characterize the FOD collected to better understand the sources of FOD on airports. The FAA hopes this study will help improve FOD management practices at large airports. The results of this two-year study will be published in 2014.